Renault SA will debut the European version its new flagship sedan, called the Latitude, at the Paris auto show in October. 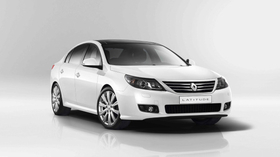 The Latitude, which will replace the Vel Satis, is derived from the SM5 large sedan built by Renault's Korean subsidiary, Renault Samsung Motors, and, like the SM5, the Renault version will be built in Korea. Renault will unveil the international version of the Latitude in August at the Moscow auto show. That version will be sold in Russia, Turkey, Australia, Mexico and Africa. The company did not release technical specifications for the Latitude, nor has it said how the international and European versions will differ. The Latitude is 30mm longer than the Vel Satis, but its width has been reduced by 30mm and it is 85mm shorter. The car's dimensions are 4890mm long, 1830mm wide and 1490mm tall. In Europe, the Latitude will compete with models such as the Citroen C6, Ford Mondeo, Opel/Vauxhall Insignia and a new flagship that Peugeot also will unveil at the Paris show to replace both its 607 large sedan and the 407 mid-sized car. In South Korea, Samsung already has received 40,000 orders for the SM5 in its first three months of availability. The SM5 was introduced there earlier this year. The SM5 is based on the platform used for the third-generation Renault Laguna and is sold in Korea with a 143-hp 2.0-liter gasoline engine. Renault did not have much success with the five-door Vel Satis, which the French automaker had hoped would make headway against premiums sedans from German rivals BMW and Mercedes-Benz. But many buyers were put off by the quirky design of the Vel Satis, which was widely condemned as ugly. Renault's Vel Satis flagship failed to lure many buyers. 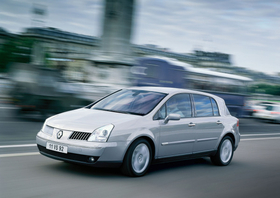 Renault planned to build 300,000 units of the Vel Satis in a six-year life cycle, but production stopped in November 2009 with just 62,201 units built in almost nine years.